The organ case is a reconstruction of Schnitger’s organ in the Lübeck Cathedral (1699), which was a true city organ, and with dimensions complementary to the Örgryte New Church. This type of organ was based on the typical North German “Werk” concept: Hauptwerk, Rückpositiv, Pedal towers on either side and a Brüstpositiv directly over the keyboards. The Oberpositiv, not visible in the façade, is placed behind and a little higher than the Hauptwerk. Reconstruction of the organ façade was made possible with the help of old photographs of the Schnitger organ in the Lübeck Cathedral, drawings of the church, and dimensions of the organ from various archives. With the aid of photogrammetry and geometrical calculations, the original proportions of the façade could be defined. The Örgryte organ’s pipe shades are also modeled after the Schnitger organ in the Lübeck Cathedral. Archival research by Dr. Kerala Snyder, New Haven, USA, confirmed that Schnitger’s façade was made by the well-known wood-cutter, Joachim Budde, during a period of several years in the 1690s. The pipework was modeled after the Schnitger organ in the St. Jacobi Church, Hamburg, where most of the original pipes were saved from destruction during the Second World War. This instrument contains the highest number of preserved pipes of any Schnitger organ, including 14 reed stops.The windchests also use the organ in the St. Jacobi Church, Hamburg, as a prototype. The organs in the St. Cosmae Church, Stade, and the Aa-kerk, Groningen, were also important references. Even though the organ was changed in certain respects during renovations and reconstruction, it was an obvious choice as the prototype for our organ. It was possible to thoroughly study the pipework thanks to the kind hospitality of the St. Jacobi congregation, its organist, Rudolf Kelber, and particularly Jürgen Ahrend, who restored the instrument at the beginning of the 1990s. The Hamburg instrument contains pipes built by more than three generations of organ builders: the Scherer family, Gottfried Fritzsche, and Arp Schnitger. Schnitger re-used some of the older organ’s best pipework for his new organ. The pipework of these organ builders differs from one another in several respects, which meant that their three different manufacturing methods had to be reconstructed for the creation of the new organ. The Scherers and their predecessors used nearly pure lead and possibly cast with a method different than that which both Fritzsche and Schnitger used for their alloys, which included tin. The metal sheets containing high levels of lead were hammered, while those alloyed with tin were planed and scraped. Through these investigations and further studies of existing old pipes, it became clear that the 17th-century organ-pipe metal in the northern part of Germany was cast on sand. Unfortunately, the sand casting technique was not described in any historical documents other than a few brief or vague descriptions, and within the frame of the project it was necessary to re-discover how this was done. The twelve bellows were built according to the preserved bellows in the Grote Kerk, Zwolle (The Netherlands). Other parts were based on analyses of measurements from various Schnitger organs in Germany (Stade, St. Cosmae Church, Neuenfelde, and Pellworm).Because a complete Schnitger wind system has not been preserved, parts of wind systems preserved in various organs and related information on the dimensions of older systems taken from church congregation archives were used as a starting point for the reconstruction work. It was decided to build a flexible system with extra ducts and valves, making it possible to test three known wind systems of larger Schnitger organs: Hamburg, Magdeburg, and Zwolle. Schnitger’s console from the organ in the Lübeck Cathedral is preserved at the St. Annen Museum in Lübeck. In order to facilitate the construction of our console, the museum loaned Schnitger’s model to Göteborg during a major part of 1997. All the details of the Lübeck console were meticulously documented in the workshop. The new North German organ console has four manuals, while the preserved Schnitger console has only three. To construct a four-manual console based on Lübeck, the organ built by Frans Caspar Schnitger (Arp Schnitger’s son) in Zwolle, The Netherlands, was used as another reference, and a picture of the old Hamburg console was also consulted. All of the details in the Lübeck design and materials were followed, with one exception: extra keys, so-called sub-semitones, were added. In order to come closer to the sound of the Baroque era, it was necessary to reconstruct the methods of this ancient organ-building handcraft. This reconstruction was possible through the combination of extensive research on pipe material, acoustics, and airflow dynamics done at Chalmers, and through experimentation and development of handcraft techniques in the organ workshop, rediscovering forgotten methods, and making them available for future organ projects. All of the research results and their practical application are documented in an extensive publication. Three organ builders were responsible for the building of the instrument: Henk van Eeken, The Netherlands (head draftsman), Mats Arvidsson, Sweden (construction of the organ [excluding the organ pipes]), and Munetaka Yokota, Japan/USA (research and production and voicing of the organ pipes). Near the end of the project, organ builder Reinalt Klein, Germany, coordinated the work in the organ research workshop and assisted with the pre-intonation of the organ. Christiane and Harald Sandler, Germany, designed the wood carvings, made drafts, and managed the wood carving group. Together with organ builders, wood carvers, apprentices, and journeymen, they made a team which included 12 nationalities. Bertil Estling was administrator during the later part of the project. Harald Vogel, Germany, was the external advisor, while Hans Davidsson, Sweden, directed the project and the research. The organ is built of oak that was donated, cut, and prepared by organ builder Oskar Metzler, Oetwil, Switzerland. The Örgryte New Church, designed by architect Adrian Petersson and built in a neo-Gothic style in 1888–1890, was renovated in 1996–1997 to meet the requirements of the organ project, and its interior was also restored. On the northside balcony stands a three-manual organ built in 1871 by Father Henry Willis. Although the new Baroque organ’s architecture is markedly different from the rest of the church’s interior, the new balcony was built in the style of the 17th century. On both sides of the organ, side balconies extend along the walls of the nave— musicians’ balconies for instrumentalists and singers. The organ is tuned in meantone with pure thirds, a tuning that Schnitger probably used in most of his instruments, and that was definitely used in the organ at St. Jacobi. In this tuning, which was normal throughout Europe during the 17th century, eight major and minor keys sound especially good because of the pure major thirds. Chromatic passages are especially effective, because there are two different half steps: the smaller, chromatic step (like f to f sharp) and the larger, diatonic one (like f sharp to g). Having pure thirds in the most-often-used keys comes with a price: the so-called “wolf” between g sharp and e flat is closer to a dissonant diminished sixth than a fifth. The circle of fifths is not closed, and the use of more distant keys is therefore limited. In order to play in more distant keys during the 16th and 17th centuries, organs and stringed keyboard instruments had sub-semitones with split sharps. The Göteborg organ has two split sharps per octave on the upper three manuals (d sharp/e flat and g sharp/a flat). These often appear in the organ repertoire from that time, and in many cases make it possible to use the organ to accompany voices and other instruments in more distant keys. In the Rückpositiv there are three sub-semitones per octave (d sharp/e flat and g sharp/a flat and a sharp/b flat), using the St. Jacobi organ during Matthias Weckman’s time as a model. The Göteborg organ is the only organ on which the whole North European Renaissance and Baroque organ repertoire can be performed in quarter-comma meantone. It is a special experience in Örgryte to hear the blending of the large plenum sound and the many reed voices with so many pure intervals. The reconstructed North German organ in Göteborg is the largest existing meantone-tuned organ, and presents a unique opportunity to perform the music of the 17th century, the golden age of North European organ music. The name with bold letters indicates that most of the pipes are made in that style. Sperrventiele: W, RP, OP, BP, Ped. Known as the “Orpheus of Amsterdam,” Jan Pieterszoon Sweelinck was the greatest single influence on the succeeding generation of north European organists and composers, including H. Scheidemann, J. Praetorius II, M. Schildt, and both Samuel and Gottfried Scheidt. Jonathan Dimmock brings these influential works to life on three landmark mean-tone organs in Holland and Sweden. Organ Works of Franz Tunder North German Baroque organ Örgryte nya kyrka, Göteborg, Sweden Pamela Ruiter-Feenstra, organist Franz Tunder was a brilliant composer of North German organ music two generations before Bach. Predecessor and father-in-law to Dieterich Buxtehude at St. Mary's Church in Lübeck, Germany, he presided over the large North German organ in a room of monumental scale. This is the first American recording of the new North German Organ, part of a research project in Göteborg, Sweden, that is changing organ building practices around the world. Detailed description of the organ and complete registrations are included in the booklet text. Two organists, both students of Sweelinck, dominated the organ scene in Hamburg in the early 1600's, but their temperaments and music are a study of contrasts. William Porter plays the landmark North German Organ of Gothenburg Sweden. Includes demonstration-improvisations of individual stops of the organ. 2-CDs, extensive notes on the music and the organ. Full registrations are included. Drawn by reports of the acclaimed organist of the Mariankirche in Lübeck, Dieterich Buxtehude, the 20-year old J. S. Bach traveled almost 300 miles to hear Buxtehude’s music first hand. On the second in our three-volume set of the complete organ works of Buxtehude, Hans Davidsson plays the ground-breaking repertoire that was known to Bach and his circle, and which may have influenced his musical compositions and performance. Buxtehude's visit with Arp Schnitger in Hamburg in 1687 began an association that lasted for many years and resulted in the building of the four-manual organ at the Cathedral in Lùbeck, as well as modifications to the organ at Saint Marien. Hans Davidsson explores the encounter between Buxtehude and Schnitger using the four-manual organ in Gothenburg, Sweden in this final volume of the complete works of Buxtehude. 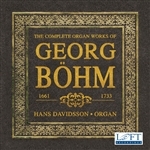 All components make this the ultimate organ CD, with two booklets comprising 56-pages of detailed information on registrations, the organ, Weckman, and his music. Organist of the Jacobi Church in Hamburg, Matthias Weckman (sometimes spelled Weckmann) was a student of Heinrich Schütz and Jacob Praetorius II. He combined elements from a wide variety of musical languages to create a clear and complex style all his own. Hans Davidsson is the world's leading Weckman scholar and this recording is the first to use Weckman's original registrations.